Auston Matthews had quite the debut last night. 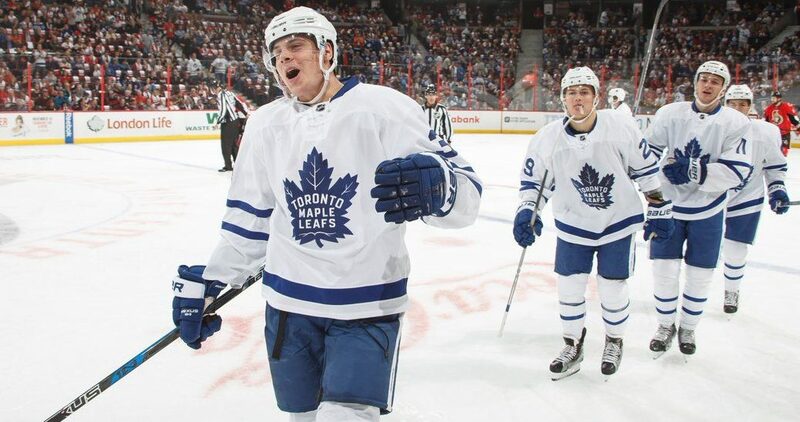 In his first career NHL game, Matthews scored all four goals for the Toronto Maple Leafs in their season opener against the Ottawa Senators. Many expected Matthews would have an immediate impact on the Leafs roster, but who could have predicted this? Becoming the first player to ever score four goals in his first NHL game, the 19-year-old quickly proved why he was the first overall selection in the 2016 draft. Less than ten minutes into the game, Matthews got his first career goal on his first career shot. Waiting in front of the net, he took a nice pass from fellow rookie Zach Hyman and buried it past a sprawling Craig Anderson. His second goal was much, much nicer. Still in the first period, Matthews beat pretty much every Senator player on the ice – stealing the puck on two separate occasions – before burying the puck past Anderson and tying the game. It didn’t take Matthews much longer to complete the hat-trick. On his first shift of the second period, he was the beneficiary of a nice pass from Morgan Rielly. Credit Matthews for getting off a quick and accurate shot for his third goal of the game. In the dying moments of the second, while everyone was already going crazy about the hat-trick, Matthews gave us all one more thing to talk about. A quick give-and-go play led to a great setup – this time from William Nylander – and he put home his record-setting fourth goal in the game. Matthews’ amazing performance somehow wasn’t enough, as the Senators actually ended up winning 5-4 in overtime, forcing the Leafs to settle for a loser point. Obviously Matthews won’t have this kind of impact on the scoresheet every game – he’s on pace for 328 goals right now. Nevertheless, it’s comforting to see he’s not having any trouble putting the puck in the net. All eyes will surely be on him again on Saturday (7 pm, CBC) when the Leafs host the Boston Bruins for their home opener.